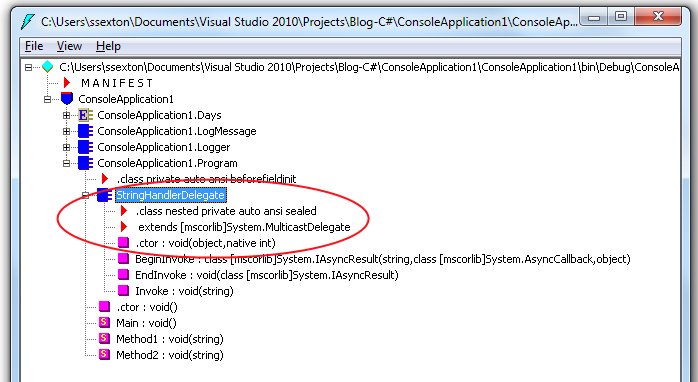 You define a new delegate in C# using the delegate keyword. This is equivalent to defining a new class that inherits from System.MulticastDelegate (which in turn inherits from System.Delegate). MulticastDelegate is a class that knows how to refer to a set of methods–known as as the delegates invocation list. Later in your code, you declare an instance of your delegate and set it equal to a method. When you do this, you’re creating an instance of the new MulticastDelegate subclass and giving it a reference to the Method1 method. You can also add a second method to the invocation list using the += operator. At this point, a new delegate is created and System.Delegate.Combine method is then called to combine the two delegates into a new delegate that points to both methods.